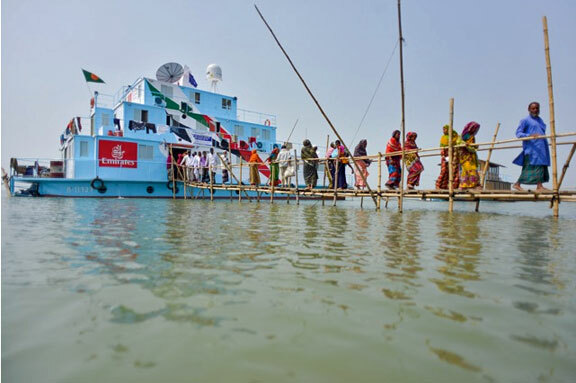 [Satnews] SES S.A. (NYSE Euronext Paris and Luxembourg Stock Exchange: SESG and FRIENDSHIP, a non-governmental organization, along with the technical assistance of Square Informatix (Bangladesh) Ltd, have launched the first state-of-the-art Maritime VSATs on three of the FRIENDSHIP floating hospital ships—Lifebuoy Friendship Hospital, Emirates Friendship Hospital and Rongdhonu Friendship (formerly the Rainbow Warrior II) Hospital. SATMED, the newly deployed satellite-based e-health platform, will enable FRIENDSHIP to establish communications with national and international doctors from remote areas, to provide medical counseling to marginalized communities through telemedicine and to exchange medical knowledge with local doctors. SATMED is an IT enabled cloud infrastructure accessible around the globe that facilitates data exchanges between professionals and medical frameworks such as electronic medical records and teleradiology systems. The platform is an open, flexible and affordable solution that perfectly fits SES’s range of satellite based e-activities. “The SATMED project is a great illustration of a true partnership between governments, the private sector and NGOs. Mutual trust and collaboration can enable innovative steps forward, and lead to deep benefits that impact directly on the beneficiaries,” said Runa Khan, Founder and Executive Director of FRIENDSHIP in Bangladesh. “SATMED gives us a tool by which we are able to bring in specialized services of e-learning, special doctors, specialized back office resources, decisions of problems and ethical decisions, all this can be centralized and the same message can be given organisation wide." 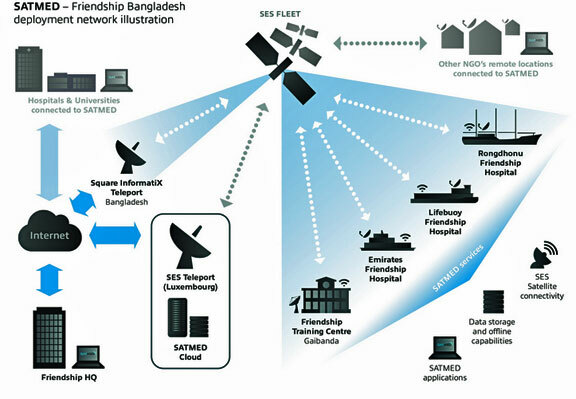 “After implementing SATMED platform tools and services, the ship hospitals – via satellite connectivity – will be able to support and facilitate work in the areas of e-care, e-learning, esurveillance, e-health management, and digital imaging,” said Gerhard Bethscheider, Managing Director of SES Techcom Services. “The SATMED platform makes e-health available, accessible and easy to use, with a goal to increase efficiency in healthcare and in-field health quality for FRIENDSHIP (the medical community) especially in remote isolated areas."